One of Britain's most popular and most mysterious attractions, Castlerigg Stone Circle is a must-see for visitors to the Lake District. The Neolithic structure, which is comprised of 38 free-standing stones, some of which reach as high as 10 feet (3m), continues to intrigue eminent archaeologists and casual visitors alike, and its original purpose is still not exactly known. Demonstrating a remarkable geometric and astronomical precision (parts of the circle align perfectly with the sun, moon and stars), it is thought that the 5,000-year-old circle once filled a very important ceremonial or religious function. However, part of what makes Castlerigg such a wonderful sight for modern-day visitors to Cumbria, is its breathtakingly beautiful natural setting. Located on a slight plateau, the views afforded from the Castlerigg site are simply phenomenal: 360-degree panoramas of the surrounding fells, and excellent vistas of Cumbria's highest peaks, such as Helvellyn, Skiddaw, Grasmoor and Blencathra. 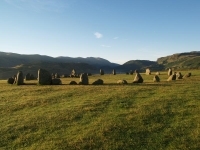 Castlerigg has been called 'the most visually-impressive prehistoric monument in Britain' by archaeologist John Waterhouse, and those who make the short trip from Keswick to view the site certainly will not be disappointed.